The University of Oklahoma’s Tri Delta chapter is apologizing for the actions of one of its members, who has since been removed from the sorority. 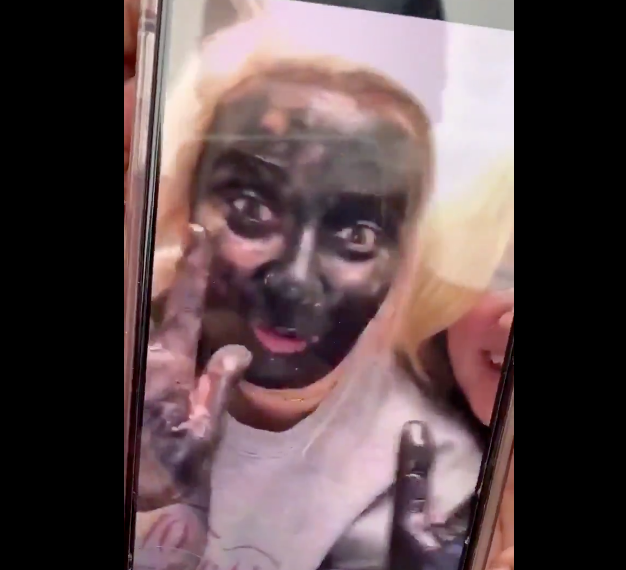 Francie Ford, an OU student, filmed a video of her friend Olivia Urban in blackface, the OU Daily first reported. The video was uploaded to Snapchat but was later posted to Twitter. In the video, the N-word can be heard. London Moore, president of the OU chapter of Tri Delta, issued a statement about the video, though it doesn’t mention the students by name. One person who saw the video on Twitter called it “disgusting.” Someone else suggested that the two students responsible for the video explain their actions to a black student group. And a fair number of people have demanded that the students be expelled from the university. In addition to the sorority’s comments about the situation, the University of Oklahoma has issued an official statement about the incident. “We are saddened and offended that even on the eve of such an important holiday for our nation [MLK Day] we are reminded how far we have yet to come in the conversation about treating everyone with respect and dignity,” the university’s statement reads. The university’s statement mentions its “mission of inclusive excellence, mutual respect and civil dialogue.” But it doesn’t include details about any specific consequences for the students, beyond saying that the students have offered to apologize.